Holub's Golden Weaver was formally described by Karel Johan Gustav Hartlaub, a German physician and ornithologist. Holub's Golden Weaver had been collected by Joachim John Monteiro, a Portuguese engineer and ornithologist. 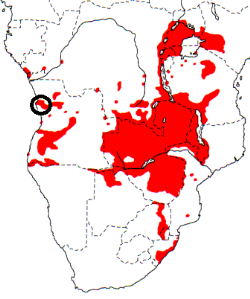 Hartlaub described several birds that Monteiro collected in Angola in 1861, but no localities were provided. A century later, hall collected birds in Angola and in studying variation in plumage and size in Holub's Golden Weaver, restricted the type locality to the lower Cuanza River in northern Angola. Over the next few years, many Holub's Golden Weaver specimens were collected in Angola and Western Africa. It was only 20 years after its discovery, that it was also found in southern Africa (in Botswana). The first illustration of the Holub's Golden Weaver was of a male, published by Reichenow (1886). 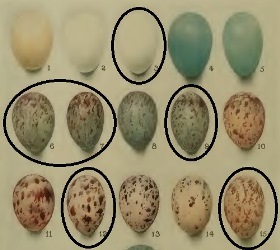 The next illustrations pertaining to Holub's Golden Weaver were by Swynnerton (1916), showing the mouth parts of chicks and also the variation in egg colour of the eggs. Hyphantornis xanthops	Hartlaub 1862	Ibis, p.342	Angola. Restricted to "Lower Cuanza River" by Hall (1960, Bull. Brit. Mus. (Nat. Hist. ), 6, p.447). xanthops Greek: xanthos, yellow; ops, the face or appearance. 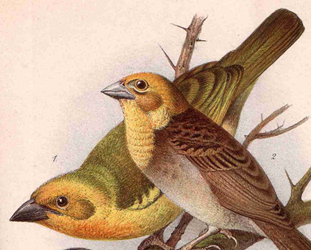 Golden-faced Weaver Bird (Layard 1884). African Golden Weaver, Camburn's Golden Weaver, Golden Weaver, Hartlaub's Golden Weaver, Jameson's Golden Weaver, Large Golden Weaver, Mashona Larger Golden Weaver, Olive-backed Weaver. Angola = lower Cuanza River. The type specimen was in the British Museum (BM 1873.12.10.4).